It’s been a very wet and windy start to the year, with the arrival of Storm Eleanor and a general period of unsettled weather. 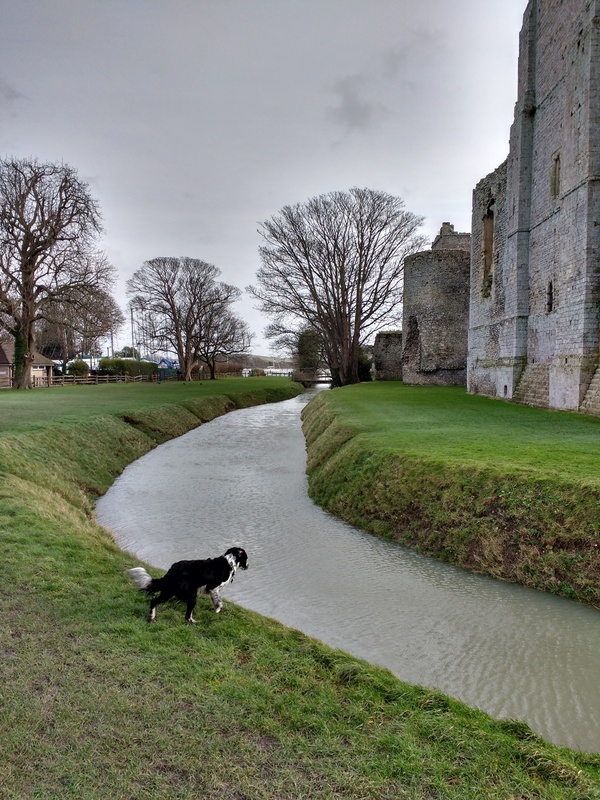 By and large we seem to have escaped the worst of the storms although we need see some rather high tides when walking the dogs at Portchester Castle (see above). The moat is normally dry but the high tide had pushed water most of the way around to a reasonable depth. We had a little rodent visitor during the week. A little mouse found it’s way into my office, and although I tried to catch and release it back outside, Wilson caught and ate it before I had the chance. A Slight Change to the layout of these posts. I thought I’d start to number these posts rather than use the date. Looking at the records in the admin part of my blog software there are 106 “Quick Links” entries, but two of these weren’t truly quick links so deducting those means that this one is Quick Links 105. I’ve also included something from one of the books I’ve been reading to add something unique to the post title. I’ll follow this layout for a while and see how it goes. Work – It’s been a quiet return to work for me this week. Catching up with a few contacts and trying to get the ball rolling again. It seems as if quite a few people have elected to take the extra few days and don’t return until Monday 8th. Allotment – The strong winds and accompanying rain have left the allotment a little bit the worst for wear, and exceedingly wet underfoot. I’ve had to resecure the netting over the brassica cage which had been blown open, but that’s about the worst of it. As I’ve not been able to get on the plot, I’ve been making sure I’ve got all the seeds, plants etc. I need for the upcoming season. I’ve placed an order to fill some gaps. I’ve also planted the remaining broad bean seeds that I had, so that I’ll hopefully have some extra plants to fill any gaps in the bed on the plot. Currently Reading – I finished reading Kim Stanley Robinson’s “New York 2140” [GoodReads] on New Years Day, which means it’s technically the first book I’ve finished in 2018, even if I was reading it for most of the week before Christmas and up to New Year. It was good and very believable in terms of a potential future for New York with ice caps melted and sea level rise and the city becoming Venice like. by David Attenborough [GoodReads]. This very much reads like a Gerald Durrell adventure and is similar in many respects, but is a great read. by Alice Roberts [GoodReads]. These latter two books where both Christmas presents from people who know me well, and the quote in the title of this post comes from this book. The ten species – dogs, wheat, cattle, Maize, Potatoes, Chickens, Rice, Horses, Apples, Humans – all seem to have interesting backstories and it’s entertainingly written. I’ve set my Good Reads reading challenge to 3o books for 2018, a little bit higher than last year but not significantly so, and still quite a bit less than the number I eventually managed to read in 2017. It’s not really about the numbers for me, so I’m not sure why I bother with the challenge in this way, but I do like to keep track of what I have read. This entry was posted in books, Garden / Allotment, Quick Links, walking, Wildlife/Nature. Bookmark the permalink. I set myself a Goodreads challenge last year but never managed to work out how to add the books I read, so I didn’t update it at all. I’m on my fourth book since Christmas, but that one has been lasting for a couple of months at least, as it’s fairly meaty.